Posted by stuffilikenet in Awesome, Brilliant words, Mutants, Science. 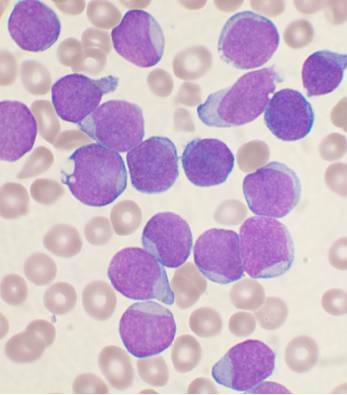 A Wright’s stained bone marrow aspirate smear of patient with precursor B-cell acute lymphoblastic leukemia. Cells from the patients’ own bodies are taken and trained to respond to CD19 protein, then re-introduced into them to their owners. Overall response rate for this treatment was 88%; even better, with disease in progress (when the prognosis usually is pretty damn grim) the response rate was still 78%. Among the best bits of news about this is the study is conducted by Memorial Sloan Kettering on 16 patients. They had done another five in a previous study. This technique can probably be applied to a number of other cancers and diseases as well; targeted immunotherapy is just in its infancy.